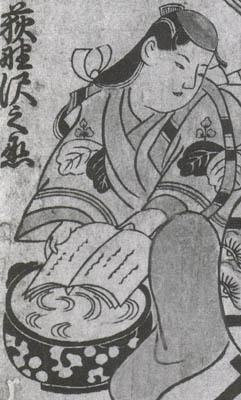 1656~1690: born in Kyôto. He starts his career in Kyôto as a disciple of the actor Ogino Chôdayû I, playing under the name of Ogino Sawanojô. 1st lunar month of 1691: Samanojô plays the role of Masaki Rokurozaemon's spouse in the drama "Yome Kagami", which is produced in Kyôto by Yamashita Hanzaemon I at Miyako Mandayû's theater. 1692: Samanojô settles in Edo. He has to change his first name, because it is very close to the first name of a Shogunate high-ranking dignitary. Ogino Samanojô takes the name of Ogino Sawanojô. 1694: Sawanojô plays at the Ichimuraza. 11th lunar month of 1695: Sawanojô plays at the Ichimuraza in the kaomise drama "Kaomise Jûnidan". His stage partner is Ichikawa Danjûrô I. This is the beginning of a great duo, the first goruden kombi in Kabuki history. 4th lunar month of 1696: Ichikawa Danjûrô I and Sawanojô achieve a great success in the same theater by playing the roles of the wicked priest Narukami and Princess Taema in the drama "Narukami Shônin Sansesô Taema no Chûjô Hime" ("Narukami"). 11th lunar month of 1696: Sawanojô achieves a great success at the Nakamuraza playing the leading role of Onna Narukami ("the female Narukami") in the drama "Neko no Koneko". 1st lunar month of 1697: premiere of the bombastic "Shibaraku" scene (Kabuki Jûhachiban), at the Nakamuraza, performed within the drama "Daifukuchô Sankai Nagoya"; Sawanojô plays the role of the courtesan Katsuragi. 3rd lunar month of 1697: Sawanojô and Ichikawa Danjûrô I play in the same theater the roles of Tamakura and Yagorô in the drama "Kantô Koroku". 5th lunar month of 1697: Sawanojô and Ichikawa Danjûrô I play in the same theater the roles of Ninomiya and Deity Fudô in the drama "Tsuwamono Kongen Soga". 6th lunar month of 1698: Sawanojô and Ichikawa Danjûrô I play in the same theater the roles of Asaka and Kamata Hyôe in the drama "Ryûjo Sanjûnisô". The role of the villain Taira no Kiyomori is played by Yamanaka Heikurô I. 9th lunar month of 1698: Sawanojô and Ichikawa Danjûrô I play in the same theater the roles of Princess Taema and the wicked priest Narukami in the drama "Genpei Narukami Denki" (also called "Kumo no Taema Nagori no Tsuki"). This is Sawanojô's last performance, who (temporarily) retires and opens an incent and perfume shop in Edo in the district of Iida-Chô. As a merchant, he takes the name of Kôguya Tôjûrô ("Tôjûrô the perfumer"). His best-selling perfume is called Ogino Shûkô. He also starts a new successful fashion with a woman hat called Sawanojô Bôshi. 11th lunar month of 1699: Sawanojô is back on stage, at the Moritaza, where he plays the role of Okuni, the legendary woman who created Kabuki, in Mimasuya Hyôgô's drama "Tôsei Okuni Kabuki". 5th lunar month of 1700: Sawanojô plays at the Moritaza the role of Tora Gozen in the drama "Dainihon Tekkai Sennin". 1st lunar month of 1701: Sawanojô goes back to Kamigata; he takes back the name of Ogino Samanojô and plays with Yoshizawa Ayame I and Mizuki Tatsunosuke I in the drama "Miyako no Waka Ebisu", which is staged in Kyôto at Ebisuya Kichirôbê's theater. 11th lunar month of 1701: Samanojô goes to Ôsaka, takes back the name of Ogino Sawanojô and plays in the kaomise program produced by Matsumoto Nazaemon III. 1703: last stay in Edo. 1st lunar month of 1704: Sawanojô appears on stage for the last time, at the Moritaza, playing in the drama "Arajishi Otokonosuke". He suddenly falls ill and dies the 1st day of the 8th lunar month of 1704. Ogino Sawanojô was an outstanding Genroku onnagata, who made a fame for himself in both Edo and Kamigata. He was one of the first actors in Kabuki history to breathe realism into his acting.